Note: I have revisited this recipe from my archives and updated it with new photos and an improved recipe. Enjoy! 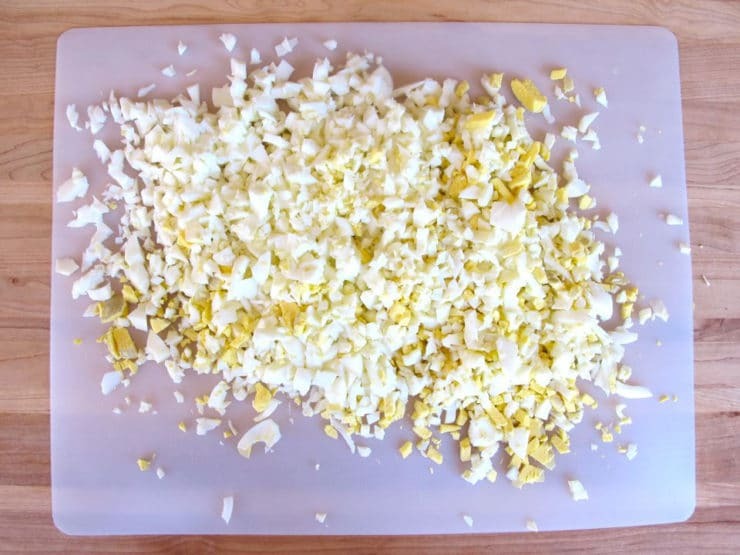 I developed this egg salad recipe for my husband, who asked me to create a lighter version of deli-style egg salad. First, I eliminated half of the egg yolks and cut down on the mayo to reduce calories and cholesterol. To make up for the flavor and richness of the yolks, I added fresh dill as well as dill pickles for saltiness and crunch. Instead of regular mustard I used whole grain Dijon, which I absolutely love. 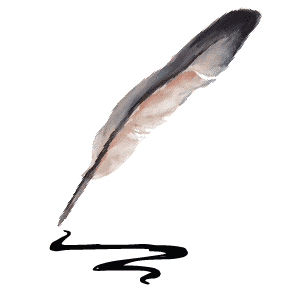 The result is something my husband enjoys on a regular basis. It makes a great sandwich; try serving it on whole grain toast, sourdough, rye or pumpernickel bread. Or, if you’re watching your waistline, you can add a scoop on top of your favorite green salad. Try subbing regular mustard for a different flavor. To reduce cholesterol even further, you can use Vegannaise instead of mayo. This salad can be made gluten free with a certified GF mustard and mayonnaise. Enjoy! 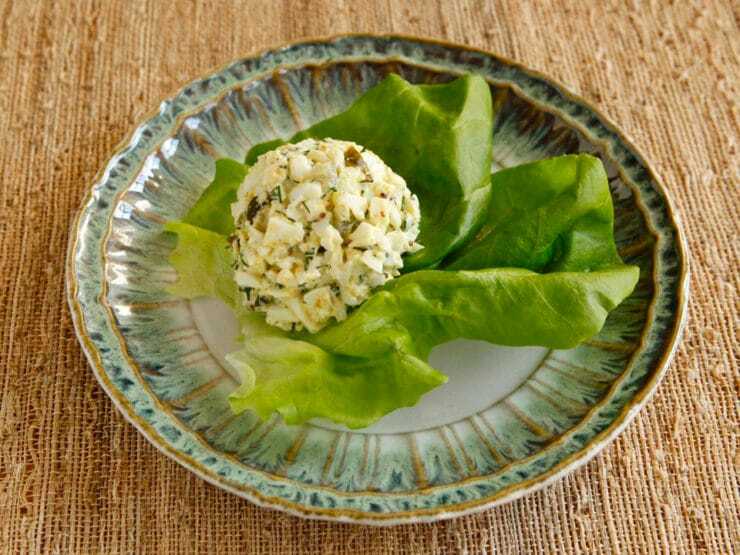 Lower calorie, lower cholesterol egg salad recipe. Fresh dill for flavor and dill pickles for a salty crunch. Kosher, Pareve, Gluten Free. Dice the hard boiled eggs into small pieces. Place the hard boiled eggs in a salad bowl. Add mayonnaise, mustard, fresh dill, and dill pickles to the bowl. Mix gently with a spoon till combined. Season with salt and pepper to taste. Chill in the refrigerator for at least 1 hour. Serve in a sandwich or scoop on salad. Your recipes sound delicious. Is there any way you could include carb counts? Diabetics would find that most helpful. I never really understand recipes such as this one. It calls for eggs, eggwhites. Hmm, why not just say a dozen eggs, either way it comes out to mean the same thing. Just my opinion!! Because, Alexis, if I said a dozen whole eggs it wouldn’t be accurate. I have omitted six of the yolks, thus leaving 6 whole eggs and six eggs without their yolks. Fabulous! Best egg salad I have ever made! Great for Weight Watchers too. I halved the recipe and it made enough for five servings. On a thin bagel…perfect! That’s great to hear Barbara! What I meant by a dough cutter was a PASTRY dough cutter. To a professional, a dough cutter is used to cut bread dough into smaller pieces. I understood what you meant. 🙂 I use my pastry cutter for things other than pastry, too… it’s great for slicing up tender things in a hurry, like bananas. Kristi Fivek Davis said that she uses a potatoe masher. Have you tried a dough cutter. I’ve been using one for years, and it works beautifully. The eggs come out uniformly, and not as big as Tori’s. Another thing that I’ve found. Instead of a diced dill pickle, try using dill pickle realish. Amazing! It’s also great in tuna salad. The brown colored spices in the photo seem like more than a dash of salt and pepper. Is there any other secret ingredient? Those aren’t spices susan, it is whole grain Dijon mustard. It adds a ton of flavor. I just love these sandwiches! Made your egg salad served on Foccaccia bread . It was great! Thanks! I bet it was amazing on Foccaccia! Glad you enjoyed! I use a potato masher-the one with holes. Works great. I love egg salad, now my wife will get off my case because of all the mayo I used to put in. Sweet egg salad bliss, come to Daddy. 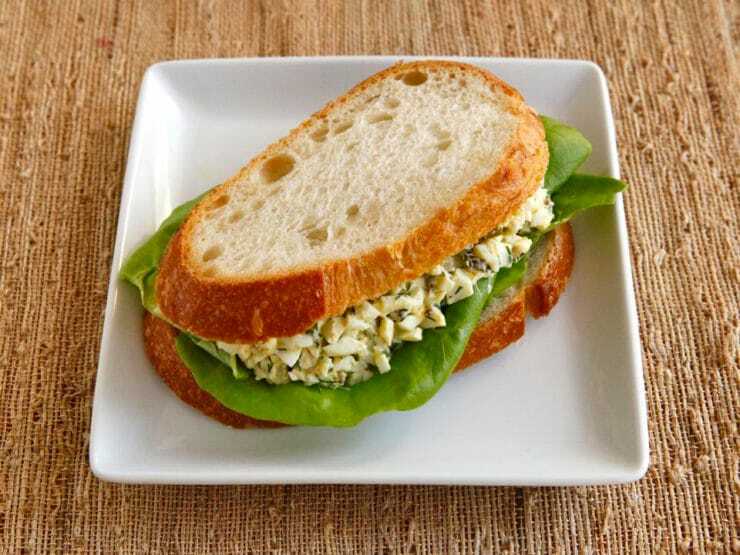 Ditch the eggs and try a chickpea salad sandwich; absolutely delicious! Yum! We eat a lot of egg salad at my house so I like the idea of a lightened-up version. We add green olives instead of pickles to our egg salad. It’s an Upstate NY thing. I would like to try this sometime although I do like my egg salad. 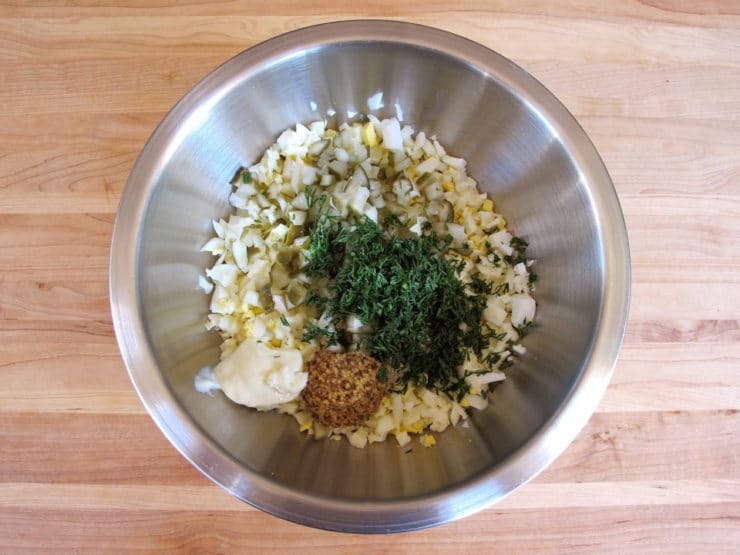 I use a little dried mustard, diced celery for the crunch, dill, S&P and mayo. I don’t worry too much about getting the eggs uniformly chopped. It doesn’t last long enough for anyone to care. Definitely one of my favorite Sandwiches. yeah, mine looks like swamp thing but tastes great! my husband is scared of my egg salad 🙂 but he eats it, OR ELSE! Do you think you could sub Greek yogurt for the mayo? 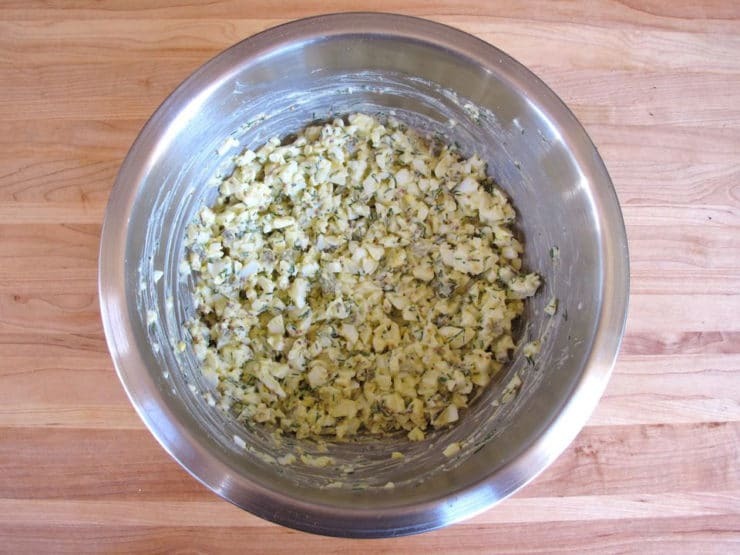 looooove making egg salad so i can control how much mayo goes in. I have not perfected the dicing of the eggs however. 🙂 Great also with a little minced scallions and lemon juice. I use a pasty cutter to cut my eggs. Works great! I am going to try this it look very good. what is vegannaise. This makes me hungry just reading it can’t wait to try! BTW I’m a shiska too, I’ve been following your blog for a month or so, super interesting and fun with GREAT food ideas. Luv it! Just had to go into the kitchen and make this. I had all the ingredients, and your photo looked so gooooood. I agree with you, it works perfectly with egg whites, the pickle makes up for the flavor of the yolks. The dill is a great touch, too! Tori, Great recipe! I LOVE that you don’t use EGG YOLKS! With the vegannaise it’s delicious this way and so HEALTHY! THANKS SO MUCH!!! I can see egg yolks in this recipe. Did you not notice them? I love egg yolks and they contain good cholesterol. What kind of egg salad is it with out onions? Moshereu you won’t find raw onion in anything on this site. I can’t stand uncooked onion. It’s just a personal taste thing. Feel free to add it if you’d like!